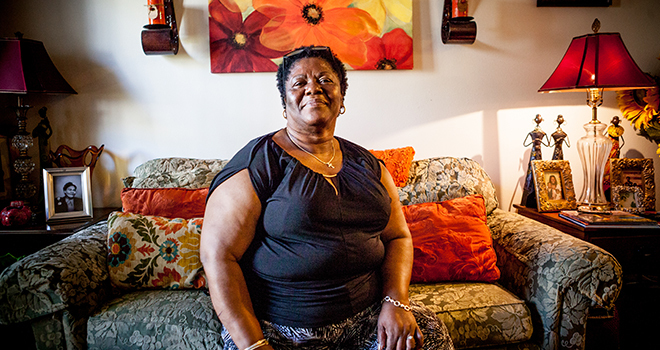 Responding to disaster by transforming the Gulf Coast region with innovative affordable housing and community centers, the Gulf Coast Housing Partnership has helped rebuild after Hurricane Katrina. Some of the more interesting projects include an old drive-in theater turned affordable housing development and a historic streetcar switching station turned community center. A resident of the housing development by GCHP that was built on the former Beverly Drive-In Theater in Mississippi. Photo courtesy of Gulf Coast Housing Partnership. Through community development investing, Praxis Mutual Funds® helps support GCHP’s efforts to create high-quality, affordable housing that includes essential services and quality of life amenities. This alliance of the nation’s most accomplished affordable housing developers and lenders has invested almost $300 million in affordable housing and community projects, and is planning to invest millions more in the coming years. This story is originally from the Praxis community development investing map. Calvert Foundation enables people to invest for social good. Through its flagship Community Investment Note®, more than 15,000 investors have channeled more than $1 billion in investments to hundreds of nonprofits and social enterprises worldwide. Investor dollars empower women, fund construction of affordable housing, provide loans to small-business owners, increase access to health care, and support fair trade and sustainable agriculture. To learn more, visit calvertfoundation.org.